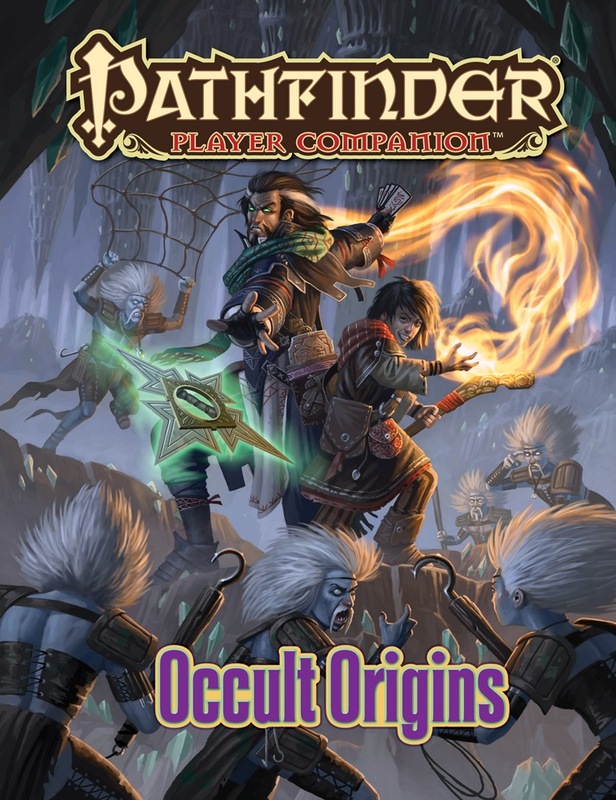 Incredible archetypes, class features, feats, and spells to broaden the scopes of all six of the new occult character classes introduced in Pathfinder RPG Occult Adventures. Uncanny archetypes such as the mind sword, the supernaturalist, the Harrowed Society student, and the primalist that bring occult powers to both core and hybrid classes. Dozens of new mystic spells to augment the power of the mind for both occult classes and arcane and divine casters. New occult feats such as Cranial Adjustment, Haruspicy, and Trepanation that provide esoteric flavor and psychic skill unlocks to any character. Occult rituals from Golarion's lost civilizations, including the Jistkan art of genie-binding and Sarkorian god-summoning. I don't think this is a terrible product, by any means. I just feel insulted. It helps pull in some flavour in some circumstances, and tries to break it in others. The Serpent Fire monk archetype does what it says on the tin and is something that /really/ should have been in Occult Adventures as opposed to this book, as much as I want to like the Karmic monk. The divine spin on Occultist isn't executed great. But enough about all that lame-o pathfinder stuff, let's get down to the meaty avatar/D&D big draw, eh? The biggest draw for you would probably be the kineticist elements, right? I know it was mine! But I'll say it now; the kineticists are half broken, half flavourless, and a big ol' heaping helping of unclear. Whouh. You think the Occultist was a slog to get through in the original OA? At least it had words. You'll be wishing for rule salad. We'll start with Phytokineticist, the wood one. First thing you'll notice: The basic utility power is missing. They just forgot to even put it in the book. Ouch. Big ouch. It's not a huge deal, it's what you expect. Trims bushes, does nothing else. But that doesn't make it better; even if you're not missing much, that's still the ICONIC ABILITY of the entire class missing, and somehow that still doesn't take away much! Phytokineticist. All I can say is "Why didn't you take earth kineticist?". It doesn't do much different from earth kineticist. It even gives you jagged flesh. The defensive power? It gives you some natural armor, which is worse than earth's DR and worse than water's armor/shield bonus. Depending on the campaign you're running, it's worse than searing flesh. The other abilities, things like being able to deal nonlethal damage easily, are all too demanding. You have to be fourth level to effectively deal nonlethal damage, and 9th level to get a VERY mild toxin (maybe sickened for one round? For 3 burn? You kidding me?). The rest almost entirely emulate geokineticist powers, but worse. 90% of the wild talents that are feasibly usable seem to be composite blasts and the rest require you to be ridiculously high level to get mild low level effects. You would do immensely better to just be a fey/verdant sorcerer. The Void/Chaos/Negative energy/Gravity kineticist is...okay. You get either negative energy or gravity. Gravity is basically just air blasts so you can use the cool negative energy powers while not being useless while fighting undead. Negative energy is a energy blast, so it's pretty good, if you don't plan on running into undead often. If you do...All I can tell you is to take some levels in Life Oracle, play overwhelming, and hope your charisma bonus can give you enough channel uses to not be completely worthless. Oh, yeah, you don't get a way to bypass the undead not being effected by your blasts. You know, how every other kineticist gets draining infusions, and how fire can sear away fire resistance? Yeah you don't get that here. Draining infusion? Rules as written, it doesn't work, Unless somehow you come across a negative energy elemental. Good luck finding that. You'll need it. I, and others, tried to ask the developers several times, if draining infusion worked. Never answered, as far as I could tell. Maybe it was, somewhere in the dozens/hundreds of posts in the product discussion. If I cant find it in 20 seconds, though, it should count as completely broken. When you buy a book, it needs to work on it's own. I can understand a editing error or something where you need to put up a FAQ or some very obscure usage where you need to form surf, that's not great, but I can't hold it against you. But this is Kineticist. You get one job when you take this class. ONE JOB. You need to know how to do it. The book doesn't tell you, leaving you and your GM guessing. Spark of life as a phytokineticist, or void kineticist? Screw you. "But wait! ", you say, "Protect from bright light? What does this mean?" You don't take penalties from bright light. "If, and only if, you have some condition that causes bright light to give you penalties, this negates those penalties. That's it. Full stop. Just like it says, with no other interactions." So, what counts as that? Vampires protect from daylight, right? No, actually. It means the specific "Bright light" condition, and only that condition, you actually get the same amount of light, so daylight still hurts. Stealth penalties from the bright light condition, right? Those penalties are there specifically from the concept of "Bright Light" in the rulebooks, so it works, right? No, they told me, it doesn't protect from that, because it doesn't reduce the amount of light that hits and reflects off of you. It creates a shadow that doesn't exist so you can ignore penalties that may or may not exist and some penalties that exist because of the concept of bright light still effect you anyways, except when it doesn't. The other aspects of Void kineticists, I could go on. There are some cool ones, like creating actual darkness, not having to breath anymore (Awesome), and using gravity mind waves to throw yourself. But really, this is all I'll say more on the matter of the Void kineticist. They missed the basic point of kineticists. The point is to actually, PHYSICALLY, primally, control the elements. The geokineticist isn't supposed to have some weird bass-ackwards conditions. It's not supposed to have a dozen asterisks on the end of each ability that say "*only applicable in very situational circumstances wherein your caster level exceeds the base 12 strength of a stone crafted by no more than twelve peasant--" NO. You PICK UP 25 POUNDS OF ROCKS AND THROW THEM. No big slog. No intense planning required for every circumstance, no 20ft long list of rules. You are the rock man. You do rocks. That's what you do. The Void Kineticist? It's just rules. It's just being a really bad sorcerer. That's all it does. It misses the fundamental basis of kineticists as a whole. I hate the medium class on it's own, and the archetypes here don't change that. If you like the base medium, and you want to give this one a spin, I can't say much. For the mesmerist, some of the tricks seem needlessly nerfed. In one, you can share senses for up to a minute per level, unless you ever open your eyes in which case it immediately ends it and wastes the trick. Why? Is it really game breaking? Couldn't it just be a swift action to delay/restart the trick, with time still wasting either way? Slip bonds is alright, but incredibly situational and I can't see an instance where you'd pick it over the better ones like psychosomatic surge. One of them allows you to make people carry messages without knowing they did it, but you have to volunteer to a mesmerist's tricks so I don't see the point. They add new mesmerist gazes, and some of them are pretty useful. Not worth the asking price of physical, not even really the 10 bucks of PDF. The divine occultist archetype, Reliquarian. It's what you'd expect and doesn't break the mold at all. I was disappointed with it. It might be my ignorance in Occultist implements, but the book gives you a few suggestions as to what your holy relic is, and then immediately tells you to get stuffed because the necromancy implement is a coin instead of the fingerbone of a saint like it suggested. I fell asleep reading the the new Psychic rules. Spiritualist archetype referenced a feat from a book I don't have on me at the moment. It kind of seems like that's what it's hanging on, so if you don't have inner sea guide on you, it's a big window shopping experience that leads nowhere. The remorse emotional focus is ok. The serpent fire adept, a monk archetype for opening the chakras, is a good archetype. It does it's job. Being a monk, especially one focused on the chakras, it's still as weak as Limbo's tax code. At around this point the book lost all interest to me. It just couldn't keep me with it's mild successes and huge pitfalls. Again, it's not a terrible book. I just feel disappointed. The Good: I can't think of a moment when the book made me want to scream in anger. The Bad: I was smouldering on a low "What the hell, man?" setting the entire time. It insults your intelligence and doesn't put forth half the effort it should. The Ugly: You'll never get to be a cool wood-bender and you'll have to be stepping on eggshells with the rules every 5 seconds as a void kineticist. The rest of the book evokes no strong emotions. Just disappointment and very mild enjoyment. Occult Origins is definitely the best of the Origins books to date. 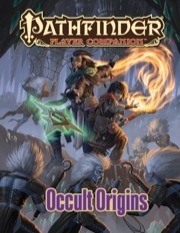 Paizo has refined the series with each successive book. Occult Origins is a book of mostly “crunch” (i.e. mechanical rules options for characters), but it is the best kind of crunch—the kind that supports the flavour of the setting as well as giving characters fun new options. The material in this book is full of flavour that both expands the world of Golarion and expands our understanding of it. And this only serves to enhance the gaming experience. Also with 6 classes instead of 10, there will be more room for each class to get some love. I need these Occult books! Or...somewhere in the dark and musty corners of an old tome shop...is it these Occult books that, for some unworldly reason, need you? Maybe both? I love me some good reading! Does anyone remember were the cover art is from? 90% sure it's from "The Harrow Handbook." We'll at the *very* least be touching on some Jalmeray things, though Vudra itself also isn't out of the question. Definitely looking forward to additional Kineticist love! I am *especially* excited about what we've got coming for the kineticist! Seriously, I'm starting to drool here. The cover art looks like Gambit. In a good way. It's not the official art yet, for the record. I am also especially excited by what Owen has in store for you with the kineticist, and in fact, I was so excited, I took the opportunity to freelance it for him. So you get whatever this secret kineticist thing is, by the original designer of the kineticist! Hope that doesn't increase the drooling too much such that the floor gets wet. Or do I? Such a tease. It does make me want this more. Since this a September release the art and product description will not be updated till later this month or early next month, correct? I can't wait to see what the Kineticist will get in this book. Also finding out what places in the Inner Sea and beyond these classes tend to be found would be very useful. I hope medium gets some new options for spirits to channel; it seem like the official version got a bit of a raw deal when compared to the playtest version. Really hoping the gunslinger gets some occult love. Not sure how, but whatever Paizo throws our way can't be bad. Perhaps something akin to Johnny Blaze when he wasn't Ghost Rider for a while (hellfire out of shotguns)? Yeah something like that or ectoplasmic bullets or an occult gun. Something that gives it that flavor that fits in. A shaman with Medium powers seems a must. Many occult spells are already in the shaman's list. If the Harrow spirit medium ends up here, that would be amazing. If not, well I can wait. But I think we all agree that some more love for the classes would not go amiss. I'm looking forward to playing either of my construct alchemists, both of whom are linked by marrage, separated by tragedy and trying to find eachother. One is a promethian acolyte, the other a construct rider. And I hope for some really cool adventures from them, and their 'daughter'. I need it! *throws money at screen* WHY DON'T I HAVE IT YET!? Y'all are awesome at making me spend money, you know that? The only way they will be able too do that one is to dedicate nearly and entire book to the Harrow spirits, or put them out piece by piece. There are so many pages that would be used. The harrow spirit medium will not be in this one since it is only a 64 page book and 54 spirits would take up almost the entire book. Besides they have already said that harrow spirit medium would not be in this book and it would more then likely be in a hardcover book one day. Player Companion line is only 32 pages. My bad, I meant 32 pages, though it would still be a problem for a 64 page book as well. Since we now know what the first two hardcover books are for next year nether of them sound like a place to put the Harrow spirits in. I didn't contribute to this product, but I would expect this to look like Advanced Class Origins, which had two pages per class. Will this provide favored class options for any additional races? For instance, the elemental races (undine, ifrit, oread, sylph) would benefit from some options with the kineticist. I don't believe we've seen options for additional races with classes from the Advanced Class Guide either. The shaman lacks similar favored class options those races have with cleric and druid. I just want to go on record saying that I'm hoping for a Spiritualist archetype that trades the manifested phantom for more heavy use of bonded manifestation and shared consciousness (sort of like a Medium, but using a Spiritualist phantom with emotional focus ). I can't wait to see the updated art and description wich should be this month. I wonder how many pages each the occult classes will get? Is it possible for fire kineticists to get an ability similar to the winter witch's unearthy cold class feature? Because just being able to trump spell resistence doesn't solve all the fire resistant/immune problems. Ouch, this is expected in October now? Previous estimates were early September. Is the explosion that happened last week at that Chinese Port City to blame for the delays? That is too bad. I was hoping to see the other options for the Psychic soon. I feel like there is something missing with the options in the Hardcover. Hoping something in this book will just Click. hopeing for a black blade/bladebound equivalent for the occultist. Though the battle host from OA itself can fairly easily scratch that itch. You can even pick an intelligent weapon for a panoply bond (extra points for using Unchained's scaling items rules to have a scaling intelligent weapon! ).